Sweden, 2007, 139 minutes, Colour. Joakim Natterqvist, Sofia Helin, Stellan Skarsgard, Michael Nyqvist, Sven- Bertil Taube, Bibi Andersson, Simon Callow, Vincent Perez, Nicholas Boulton, Steven Waddington, Milind Soman. 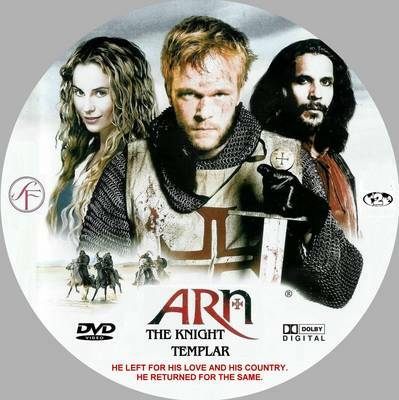 Arn: The Knight Templar is one of two films based on the novels by Jan Guillou. They are Mediaeval epics, focusing on the Crusades as well as the civil disturbances in Sweden in the 12th century, leading to independence from Denmark and Norway and to Swedish nationhood. All these themes are included in this film as well as its sequel. Musician Joakim Natterqvist portrays Arn, a young man who is brought up in a monastery, is trained in war skills, encounters a young woman Cecilia, has a child and is judged by the church court along with Cecilia. She is sent to a monastery. He is sent to join the Knights Templar and spend ten years fighting in the Holy Land with the Crusaders. The film intercuts the story of Arn, his encounter and friendship with Saladin, his work with the Knights Templar in Palestine, his serving out his time as a knight, the jealousy of the successor to the superior in the knights and his being forced to stay in Palestine. He gives advice as to what Saladin might do but is ignored. In the ensuing battle, he is wounded, captured and allowed to go home by Saladin. In the meantime, Cecilia has spent ten years in the monastery, ruled over by the severe abbess (Bibi Andersson). She is offered the task of being abbess in another convent but declines. She is reunited with her son, and with the wife of the king who has been sentenced to serve in the convent and is cruelly treated there. Having received news that Arn had died, she is surprised when he returns, there is a happy reunion, Arn meeting his son. However, the tribal clashes still continue and there are fights (in the Braveheart vein) between the different clans until final success and the uniting of the peoples for the nation of Sweden. There have been a range of films over the decades including de Mille’s The Crusades, the 50s King Richard and the Crusaders, The Kingdom of Heaven from Ridley Scott. This film is quite spectacular for a Swedish production. 1. The popularity of Mediaeval tales, the Crusades? The interest in the Scandinavian contribution? 2. Audience knowledge of the Crusades, the Crusaders and their motives, the role of religion and faith? Catholicism? Islam? The Saracens, the clashes with the Crusaders? The kingdom of Jerusalem? The role of Saladin? 3. The Knights Templar, the background of their establishment, for the Crusades? Audience knowledge – and the overtones of The Da Vinci Code? 4. The basis in a Swedish novel, Swedish history, the clashes of the clans, Norway and Denmark, independence? Power wars? The emergence of Sweden as a nation? 5. The two strands of stories and their intercutting, their comment on each other? 6. The convent, Cecilia, her being sentenced to enclosure, the baby taken away from her? The abbess and her clan, the severity of her rule? Cecilia staying, the details of life in the convent? The flogging of the other Cecilia? Her internment? The light and dark, the memories of Arn? 7. Arn’s story, his parents, his growing up in the monastery, the friendship of the abbot, his being trained in martial arts, in archery? Growing up, returning home, the welcome, his relations, the supporters? The clashes of the clans? The confrontation, the champion and his being bested, humiliated? Arn stepping in, his skill in fighting? His encounter with Cecilia, the lyrical romantic sequences, her pregnancy, the baby, his being judged, sentenced to the Holy Land? The flashbacks and his memories? 8. Palestine, the Holy Land, the years passing, Arn’s encounter with Saladin, his adviser? The bond, the discussions, the respect – yet Arn still willing to fight against him? With the Templars, the kind attitude of his superior, listening to Arn and his strategies? The victories? The honours? His being able to go home? The assistant Templar, his taking over, his jealousy and criticism, his placing conditions on Arn? The trek through the desert despite advice? The hardships for the troops, the water? The defeat and the battle? Arn being wounded? Taken by Saladin, their discussions, Saladin sending him home? 9. Saladin and his reputation, the Muslim background, traditions, his adviser? Travelling in Palestine to Egypt? The invasion, the strategies? Arn and his contribution? Saladin saving him, the later defeat of the Christians, Saladin and his sending Arn home? 10. Arn and his return, Cecilia thinking he was dead, meeting her, his son? The cousins and family, members of the clan? 11. The king, the threat of the clan, his wife? The battles, Cecilia and her leaving the abbey, the offer for her to become an abbess? 12. The wars, the visualising of them? The abbess and her death, asking Cecilia’s forgiveness? The leaders, their strategies, the role of archery in Arn’s victory? 13. The restoration of peace, the unification of Sweden? 14. Drama, epic, action, nationalism?